Well, not exactly. It is the first recorded witch trial. That is, the first whose details are written down, rather than a terse "hanged for being a witch." The other woman, Macette, readily confessed everything when she was questioned, including knowledge of how to bring harm to someone. 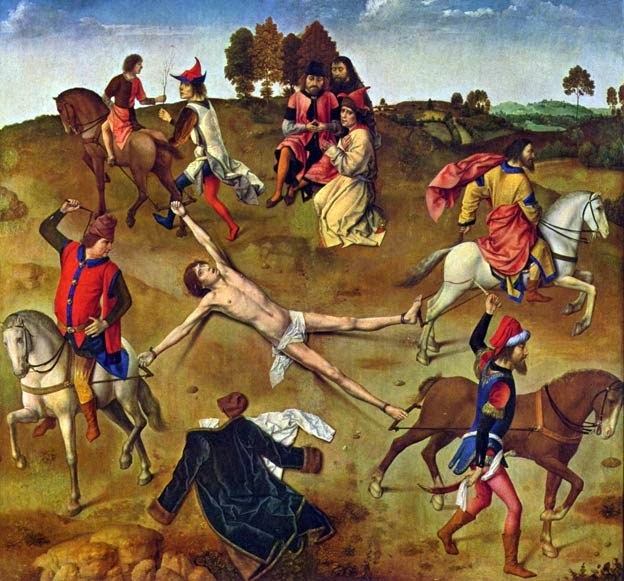 Macette and de Brigue were both executed on 19 August 1391. But this was not always the standard order. In the antistoichia pattern, the order of words in a lexicon (such as Suidas') might follow the order of the spelling of sounds. Words that begin with alpha+iota as a diphthong, for instance, would be a separate entry to follow words that are spelled with alpha, even if they included alpha+iota, because they sounded like a different letter. This can throw off reading of partial manuscripts unless the researcher is familiar with the old practice and can adjust expectations accordingly. England had become more liberal under Richard II. John Wycliffe had pushed for a more people-oriented approach to Christianity that focused far less respect on the hierarchy of the Church—the hierarchy of which Arundel had reached the pinnacle in England, as Archbishop of Canterbury. Wycliffe had even started producing parts of the Bible in English, accessible to more people. 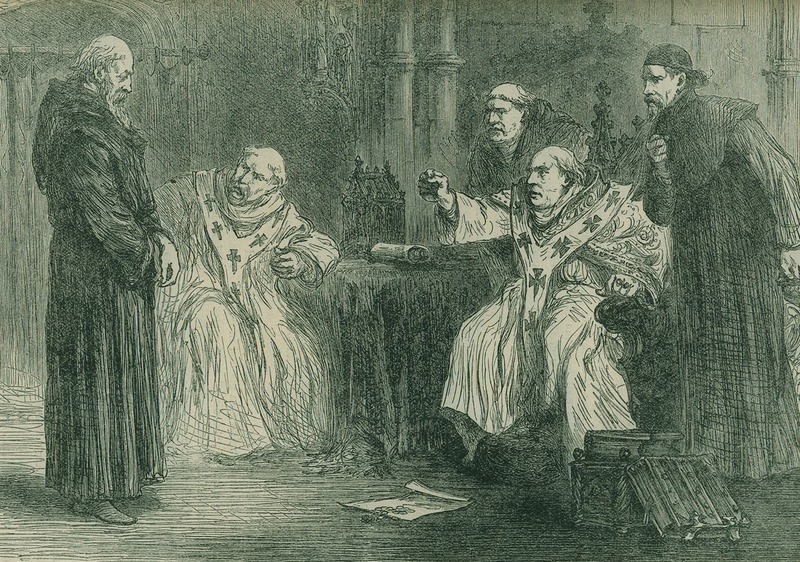 The followers of Wycliffe, called "Lollards," were considered heretical by many, and especially by Arundel. Prior to his exile, he had tried to curb that hotbed of Lollardy, Oxford, and had been rebuffed and insulted by its chancellor. Now, restored as archbishop under Henry IV, Arundel had a freer hand to pursue his goal of asserting harsher control over the moral fiber of the realm. But would Arundel's dislike of these portraits turn into action? Well, it was during the reign of Henry IV (in 1401, in fact) that England started burning heretics, and a few years after that (1407) Arundel made knowledge of the Bible by non-clergy a sign of heresy. 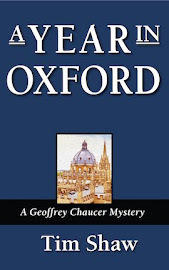 He was controlling, heavy-handed, vengeful when it came to Oxford and Lollardy and of anything that attacked or mocked the hierarchy of the church. Jones et alia assert that Arundel's need to change the tone in England may have been the guiding force behind Chaucer's difficulties at the end of his life (Henry IV officially confirmed Chaucer's annuity, but records show that the payments weren't actually forthcoming) and the obscurity with which he was treated when he died—although praised by fellow-poets during his life, there is no public notice taken of his death. Chaucer might have seen the writing on the wall; hence the Retraction he wrote for the Tales in which he asks forgiveness for his vulgar stories and prays for God's mercy, in a tone very different from everything else he has written. *I give full credit for this theory to the authors of Who Murdered Chaucer, discussed in a previous post. Let us talk about the "Worst Briton" of the 15th century, according to a 2005 poll of historians, and the man who may have been Chaucer's greatest enemy. 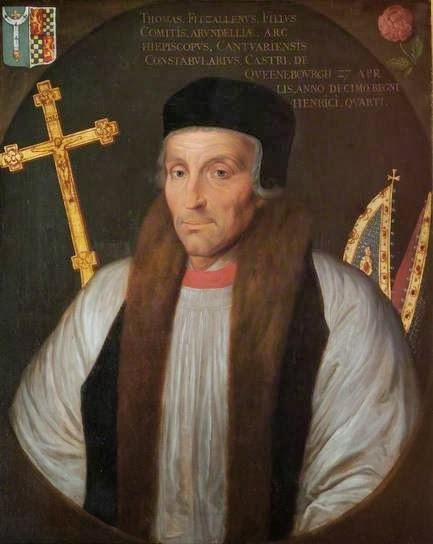 Thomas Arundel (1353-19 February 1414) was a well-born lad of 20 at Oxford when he was made Bishop of Ely. He showed no particular proclivity to the religious life (or the scholarly life, for that matter), but his father—who had considerable financial standing at the court of the increasingly feeble-minded Edward III—arranged it for his son. Ely was a very lucrative position, and Arundel might have been comfortable with it, but good and bad fortune were to follow. The reign of Richard II, starting in July 1377, was tumultuous. The Peasants' Revolt, waves of the Black Death, financial excesses of the Crown, continuing tensions with France, and maybe just the fact that a France-raised child was now king—all these and more contributed to a general unrest in England. Parliament took steps to curb Richard's authority, creating several political crises as loyalists faced off against the elements of the aristocracy that wanted to increase their own power. But how did any of this make Arundel into Chaucer's enemy? In 1399, Henry Bolingbroke invaded England and attacked his cousin, Richard II, with the intent to take the throne from him. Arundel joined him, and upon Henry's ascendance to the throne as King Henry IV, Arundel once again became Archbishop of Canterbury, the most powerful prelate in the land. While Henry worked to reverse many of the political works of Richard's reign, Archbishop Arundel set about to change the moral climate of the realm, which he felt had become very slack. To do that, he had to undo the damage to society perpetrated by two of his countrymen: John Wycliffe and Geoffrey Chaucer. *And a huge problem, since the Avignon Crisis was going on at the time, and Scotland recognized the Avignon pope, not the Roman pope, who had already put his own Avignon-loyal bishop in St. Andrews. Boniface needed England's support against Avignon and was happy to help him in the Arundel matter. The 25th of October 1400 is the date of the death of Geoffrey Chaucer. Based on the records that exist from 14th century England that refer to him (over 300 of them! ), we assume a birthdate around 1340. That would make him about 60 years old at the time of his death, a perfectly respectable number from which one could die of old age. Terry Jones, who once amazed us all as the logical Sir Bedivere in Monty Python and the Holy Grail, collaborated on a book that explored what he considers the unsatisfying approach history has given us about the death of the English poet. 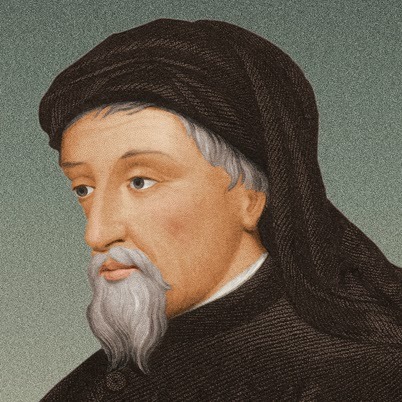 Who Murdered Chaucer asks why—given that Chaucer was a well-known poet as well as a well-connected civil servant in his lifetime—his death occurs in absolute historical silence. Jones and company have a theory, and it is because Chaucer was so integrated into the culture of his day. Besides having enjoyed several well-paying positions, Chaucer had done diplomatic work for his king and was probably more "connected" than most civil servants. When Henry Bolingbroke rebelled against King Richard II and wrested the throne from him—becoming King Henry IV on 30 September 1399—the regime change would have swept from office and political favor those like Chaucer. In December of 1399, Chaucer had taken out a very long lease on his new apartment; would he have done so if he wasn't healthy and didn't expect a long life ahead of him? He hadn't finished his major work, The Canterbury Tales: according to the "plan" in the Prologue, each pilgrim would tell two tales on the way to Canterbury, and two tales on the way back; the approximately 120 tales would have "one-upped" the 100 tales of Boccaccio's Decameron. Perhaps Chaucer expected a long and peaceful retirement, continuing what he loved to do, out of the public eye. The authors also point out that Chaucer's contemporary and friend, John Gower, changed the dedication of his great poem, the Confessio Amantis [Latin: Confession of the Lover], from Richard II and Chaucer to Henry Bolingbroke. Even if Gower decided he wanted to support Henry over Richard, why the omission of his friend Chaucer from the dedication? Was Chaucer becoming persona non grata [Latin: "person without grace" or "unwelcome person"] in the changing political climate? But does all this mean that Chaucer was murdered? The title of Jones' book seems more than a little sensationalistic. Would the king really have taken such a personal interest in suppressing the fate of Chaucer? Or did Chaucer have an even more oppressive and powerful enemy who held a grudge against him and would be motivated to suppress the poet? There's reason to believe, however, that he didn't exist, and that what we think is the name of an author/compiler of the encyclopedia was the Byzantine Greek word for "stronghold" or "fortress" and was meant to refer to the work itself as a stronghold of learning. In lieu of definitive data on the author, the work is usually called "Suidas' Lexicon" or the Lexicon Graecum [Latin: Greek lexicon]. The Lexicon has two chief parts: a list of word meanings and origins (with quotations), and a history of the classical world with names and events and passages from works that would otherwise be totally lost to us. The lexicon can be found online, translated and heavily annotated, for those interested in seeing what a thousand-year-old lexicon looks like. Go here and click the link "Entire list of entries." *Interestingly, the lexicon is in alphabetical order, but not the alphabetical order we would expect, even if we are familiar with the Greek alphabet. Someday I'll get around to a post on antistoichia. I shocked myself the other day when I mentioned Duns Scotus in the post on St. Ivo and found that I had nothing in this blog to which to link! 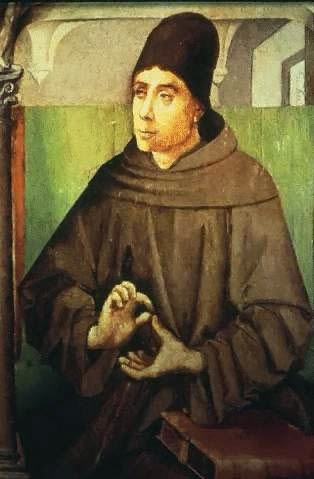 In 300+ posts I had somehow passed over Duns Scotus (c.1266-8 November 1308). His contemporaries refer to him as Johannes Duns, and since there was a practice of using the Christian name plus place of origin, it is assumed that he came from Duns in Scotland (although a very late notation on a copy of his "final exam" on the Sentences of Peter Lombard claims he was from Ireland). We know that he was accepted into the Franciscans on 17 March 1291. Since the earliest age at which he could be accepted into the Order was 25, and since we assume he was accepted as soon as his age allowed, we surmise that his year of birth was 1265 or 1266. That encompasses most of what we "know" of the personal life of the figure who was called Doctor subtilis [Latin: Subtle doctor] due to his penetrating philosophical and theological insights. He got into some trouble in June 1303 while lecturing at the University of Paris. King Philip IV "the Fair" of France (previously mentioned here) was taxing church property. Understandably, he was being opposed by Pope Boniface VIII. Scotus sided with the pope and was expelled from France with about 80 other friars. They were back about a year later. Both (5) and (6) have several sub-arguments, and after (7) he moves on to further details. His underlying assumption that makes much of his thought work is that God is infinite. He also championed the doctrine of the Immaculate Conception of Mary, quoted in 1854 by Pope Pius IX in his declaration of that dogma. Pope John XXIII (1881-1963) recommended Scotus' writings to theology students. In 1993, Pope John Paul II (1920-2005) beatified him. There was a movie made about him in Italy in 2011, available on Amazon. 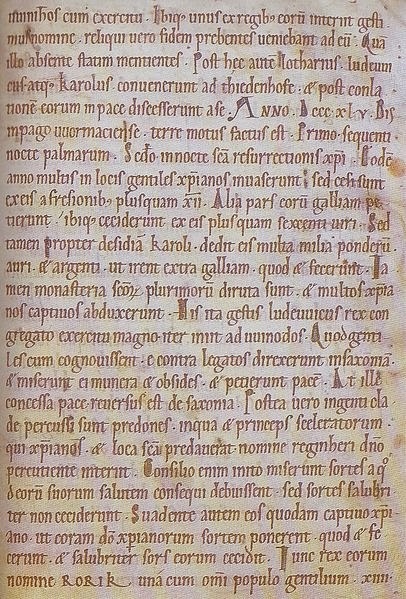 The Edict of Paris, an outline of laws and rights in the kingdom of the Franks, has been called "the Frankish Magna Carta." It was produced by Clothar II (584-628), mentioned in this blog when he commissioned a golden throne. The comparison to Magna Carta is not simply because it is a set of laws. Just as King John in 1215 was forced to share power with his barons, Clothar had to make concessions to the nobles who had enabled him to wrest the kingdom from his cousin, Sigebert II. Some of the 27 clauses, however, were designed to modify in the king's favor some of the statements from a recent ecclesiastical synod in Paris. For instance, the Paris synod declared that bishops be chosen by the church; Clothar's Edict declared that only bishops that he approved should be ordained. Otherwise, the Edict establishes some commonsense responsibilities in order to ensure felicitas regni [Latin: the happiness of the realm]. Judges were to be appointed in their local regions (presumably, this prevented the king from appointing one of his close companions with no local knowledge to preside over some noble's region). Poor judges were to be dismissed by the king, or by the local bishops if the king were unavailable. Everyone had the right to bring a lawsuit. Women had the right not to be married against their will. Not every clause was aligned with modern sensibilities, however. 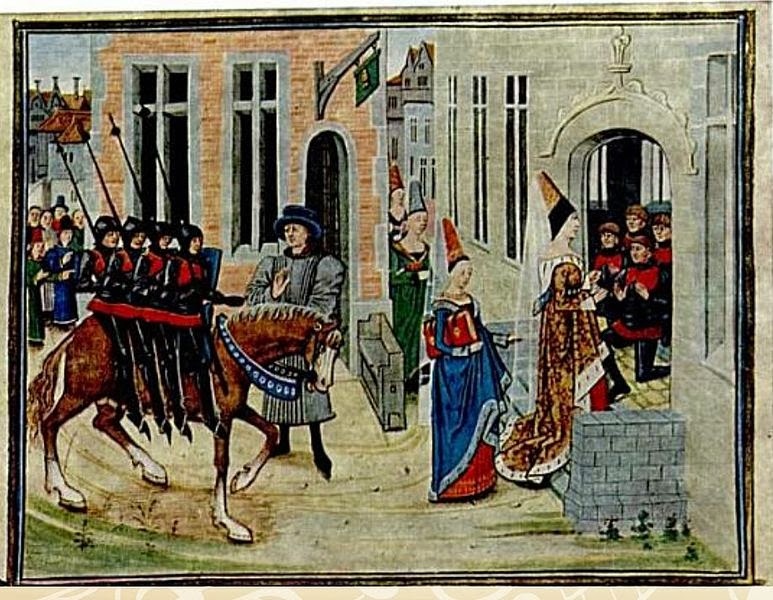 The not-uncommon anti-Semitism of the Middle Ages was part of the Edict: Jews in positions in the royal government had to quit or convert to Christianity. The Edict of Paris did not become a lasting cornerstone of Frankish law. After the reign of Clothar's successor, Dagobert I, it was superseded by later documents. The term "John Doe" is familiar to just about everyone who knows anything about the North American* legal system. Who are these men, and where did the tradition for these names start? We find the names being used in legal documents in England as early as the reign of King Edward III (1312-1377). But there is a slightly earlier instance recorded that seems to have escaped the notice of online encyclopediæ. It is the story of the Widow of Tours that is part of the legend of St. Ivo, and it was recorded in the Fordham Law Review by a lawyer who discovered the tale while vacationing in France. Ivo ... lodged with a certain widow. One day he found his widow-landlady in tears. Her tale was that next day she must go to court to answer to the suit of a traveling merchant who had tricked her. It seemed that two of them, Doe and Roe, lodging with her, had left in her charge a casket of valuables, while they went off on their business, but with the strict injunction that she was to deliver it up again only to the two of them jointly demanding it. That day, Doe had come back, and called for the casket, saying that his partner Roe was detained elsewhere, and she in good faith in his story had delivered the casket to Doe. But then later came Roe demanding it, charging his partner with wronging him, and holding the widow responsible for delivering up the casket to Doe contrary to the terms of their directions. And if she had to pay for those valuables it would ruin her. "Have no fear," said young Ivo, "You should indeed have waited for the two men to appear together. But I will go to court tomorrow, for you, and will save you from ruin." So when the case was called before the Judge, and the merchant Roe charged the widow with breach of faith, "Not so," pleaded Ivo, "My client need not yet make answer to this claim. The plaintiff has not proved his case. The terms of the bailment were that the casket should be demanded by the two merchants coming together. But here is only one of them making the demand. Where is the other? Let the plaintiff produce his partner!" The judge promptly approved his plea. Whereupon the merchant, required to produce his fellow, turned pale, fell a-trembling, and would have retired. But the judge, suspecting something from his plight, ordered him to be arrested and questioned; the other merchant was also traced and brought in, and the casket was recovered; which, when opened, was found to contain nothing but old junk. In short, the two rascals had conspired to plant the casket with the widow, and then to coerce her to pay them the value of the alleged contents. Thus the young advocate saved the widow from ruin. Wigmore does not say in his article whether this was the origin of the names John Doe and Richard Roe. If the tale was in fact part of the life of the young Ivo, who died prior to the examples found in English court documents (as opposed to being tied to his reputation for cleverness and helpfulness by later generations), then it is either a possible origin for the names, or an example of usage that exists prior to the examples usually noted. Or it is just a nice story. *"John Doe" is used in the USA and Canada; the United Kingdom, New Zealand and Australia use "Joe Bloggs." To be fair, there are numerous other names for "typical" or "anonymous" individuals, in English-speaking countries and others. Everyone has an intercessor in Heaven, even lawyers. Ivo of Kermartin (17 October 1253-19 May 1303) was born in Louannec, in Brittany. He studied civil law at the University of Paris, mingling with students such as Roger Bacon and Duns Scotus. He stood out from the crowd by abstaining from meat and wine, fasting with bread and water during Lent and Advent, and sleeping with a stone or book as a pillow. He also studied and prayed and helped the sick while his fellow students were having fun. 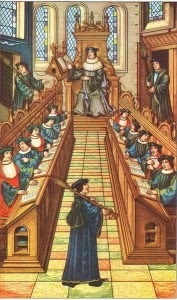 In 1277 he went to study canon law in Orléans before returning to Brittany as a judge. Once, not being able to reconcile a mother and a son who pleaded violently against each other, he went and offered up mass for them, and they immediately came to an agreement together. He never took a fee, but pleaded all causes without any gratuity. He also studied Scripture and was ordained to the priesthood in 1284. His presence in their dioceses was desired by several bishops. He also used his own funds to build a hospital. He was canonized in 1347 by Pope Clement VI. Besides attorneys, widows and orphans, he has been named the patron saint of "abandoned people," bailiffs, Brittany, canon lawyers, judges, and notaries. The city of Bath in England has been an important location for human beings for millenia. The spring there produces 240,000 gallons of 114° (Fahrenheit) water every day. This phenomenon amazed our ancestors; they attributed it to divine forces, most notably the goddess Sulis. When the Romans came, they named the place Aquæ Sulis [Latin: The waters of Sulis], and equated Sulis to Minerva, the Roman goddess of wisdom. The Romans used the spring for an elaborate system of channels and pumps and rooms for bathing, both for relaxation and for health. In 1965, beneath the Grand Pump Room of the Roman complex, at the level of a Roman-era temple to Sulis Minerva, the stone pictured here was discovered. 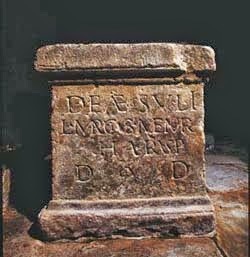 The inscription reads "DEAE SVLI L MARCIVS MEMOR HARVSP DD" and stands for "To the goddess Sul, Lucius Marcus, a grateful Haruspex, donated out of his devotion." The presence of a Haruspex in Bath raised eyebrows. A Haruspex [Latin (roughly): entrail observer] was one who predicted the future by examining the guts of animals (as well as other natural phenomena). This was a very old practice, known to Romans and before them the Etruscans. Its presence can be established in the East prior to Greco-Roman times as well. Haruspices (the plural) were not common—only 60 existed at a time—and practiced an art that, like astrology, not everyone believed in but that they might turn to for special occasions. The presence of a Haruspex in Bath in a location so far from Rome suggests how significant Bath/Aquæ Sulis was to the locals at that time. Curiously, the inscription has been "edited." "MEMOR" is actually carved as "MEMR" with the "O" added above the second M. "HAR" is centered on its line, with "VSP" in smaller letters crammed afterward, throwing off the symmetry of the inscription. The "MEMOR" looks like a necessary edit after the carver's accidental omission of the "O." "HAR" might have needed the addition because the rarity of the position meant the abbreviation wasn't familiar to people who didn't know that "HAR" meant a Haruspex. Another theory is that the carver simply was not very literate, and that Lucius Marcus had to have him edit the stone after the initial carving. Yesterday was the anniversary of the Battle of Hastings, when the forces of William the Conqueror (mentioned many times; see one of them here) defeated the English and killed King Harold Godwinson. The link in the previous sentence for the Battle of Hastings tells more of the story than is generally known, namely that Harold's army had been on the march and fighting for weeks prior to Hastings. Also not generally known is that someone was proclaimed King of England the day after the Battle of Hastings, and it was not William of Normandy. Edward the Confessor supposedly saw the impending trouble with succession to the throne of England and saw a way out: he had a nephew who was the legitimate heir: Edward (1016-1057), called "the Exile, who had fled to Hungary after being ousted from England after the defeat of his father (Edmund II "Ironside," c.989-1016) by King Cnut. Edward the Confessor had called Edward the Exile back to England to make him his heir. Sadly, the Exile died very soon after his arrival back in England in 1057. History does not record a reason, but it is possible that he was eliminated by the Godwinsons, who were very powerful and wanted to see Harold succeed to the throne. Edward the Exile had left children behind on the continent, however. Edgar the Ætheling (c.1051-c.1126) was only a teen in 1066, but his youth was no bar to the succession. 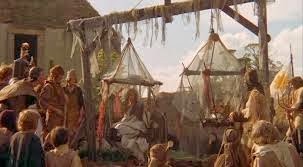 The witenagemot, the council of wise men that approved the succession in Anglo-Saxon England, met in London and chose Edgar as king the day after Harold fell at Hastings, and sent for him to return to England and lead the opposition to William of Normandy. The men who chose him, however, chose not to defend their choice and resist William as his forces approached; instead, they negotiated with William for a peaceful turnover of the kingdom. In December, the aristocracy of England met with William at Berkhamstead to submit themselves to his rule and hand over Edgar. William took Edgar and some other English leaders into custody in order to ensure future cooperation. In 1068, Edgar fled captivity with his mother and two sisters (Margaret and Cristina) to return to Hungary, but their ship was blown off course and landed in the north of England, where they were taken in by Malcolm* III Canmore, king of Scotland. Malcolm married Edward's sister Margaret (who later became Saint Margaret). Edgar had an "on again, off again" relationship with William and an adventure-filled life. He was still alive in 1125 according to William of Malmesbury, so his date of death assumed to be c.1026. *Malcolm was the model for the character in Shakespeare's MacBeth. The Battle of Hastings took place on this date 947 years ago, and a king died. Many people know this, and are aware that it was a turning point in the history of what we call Western Civilization. Fifteen months and one day ago, I posted this, explaining some of the details of the political situation that led to Hastings. Fifteen months ago, I posted this, explaining some of the events that took place just before Hastings that made Harold's forces the underdog. There is always more to tell, however, such as: how did the battle actually play out? Sources for the Battle are surprisingly numerous, although all must be considered through the filter of historical prejudice (for instance, English sources emphasize the size of William's army over Harold's). We can collate them, however, and make an educated estimate as to the chronology of the battle. The first point to remember is that William had two weeks since making shore at Hastings to arrange his army, since Harold was defeating a Norwegian invasion up north. Inexplicably, the Normans had not taken the high ground during this fortnight. Harold's army arrived on 13 October; William arranged his Norman forces in case of a night attack. The morning of the 14th, Harold began to arrange the English on Senlac Hill*; before they were completely organized, however, William attacked at about 9:00 in the morning. 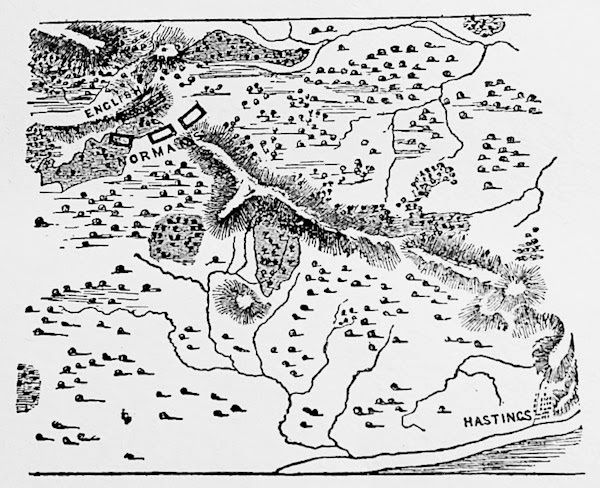 The battle likely included several Norman retreats (mentioned by several sources), both real and feigned, which caused the English to follow with sometimes disastrous results, finding themselves outside their defenses and their advantageous high ground and prone to being surrounded and killed when the Norman retreat reversed course. Even with these events, however, and the general exhaustion of Harold's army, the English might have held off longer against the Normans. Late in the day, however, a stray arrow hit Harold in the head, possibly piercing his eye. Harold's brothers already having died earlier in the day, the army was left with no clear leader. The English went into retreat, pursued by the Norman cavalry. This would have been in the evening, when darkness made pursuit risky. The English probably paused at a broken rampart which they attempted to use for defense, and there is an account that many of the Norman cavalry perished when they rode headlong into a ditch. Still, the English were done with the battle. William returned to his camp at Hastings, and began a campaign that lasted many months to subdue the rest of the country. William assumed that his way to the throne was clear. There was, however, another claimant to the throne of England—a legitimate claimant. We will look at that story tomorrow. *There is a claim that the battle took place not on Senlac Hill but on Caldbec Hill a mile away. The author's evidence has swayed some, but tradition has not yet given in. Speaking recently of Dafydd ap Gruffydd and medieval food prices put me in mind of some of the data we have on the household of King Edward I in the late 13th century. The "royal household" was responsible for organizing all domestic arrangements—from funds to furniture, from beer to bacon—for up to 600 people. 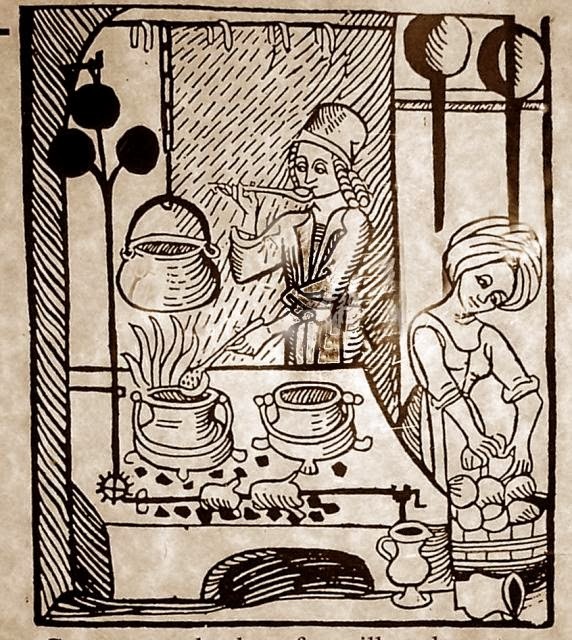 When it came to food, the royal household had two kitchens: one for the king, and one for the rest of the household. Cinematic scenes of the king presiding over a large feast hall were a rare event in the Middle Ages. He usually ate in his private chambers with a few close family members or staff, joining the crowd for special occasions such as Holy Days. The store of spices was reserved for the king, and included caraway and cumin, ginger and sugar, almonds and rice and pepper. Although the household in general may have had less in the way of flavoring, it had plenty in the way of food. Records for the kitchen supplies of 1291-2 survive and give an idea of how much was consumed. Beef, pork, and mutton were the primary meats, with chicken and duck and enormous numbers of eggs supplementing. The Christmas meal for 1291 included 1742 chickens, 22 pheasants, 17 dozen partridges, 16 dozen mallards, six dozen plover. An attempt was made to curb the expenses of the royal household in 1300 with the Statute of St. Albans, which trimmed the list of those attached to the Court who were entitled to free meals. Instead, cash was offered to members of the Court to find their provender elsewhere. Although accounts show that the savings was a temporary effect—the cash amounts rising over a few years—cash instead of food would have made less work for many of the staff involved in organizing the household. *a quarter was one-fourth of a hundredweight; a hundredweight was equal to 112 pounds; so a quarter was 28 pounds. Yesterday I mentioned that the Ardennes region in northeast France was a wild area prone to generating legends. One such legend is that of The Four Sons of Aymon. "Duke Aymon of Dordone" was a literary character attached to stories of the court of Charlemagne. (Charlemagne's era was so revered that, like "King Arthur," in centuries afterward his court became the nucleus for legends and fictitious characters.) Aymon had four sons: Reynaud, Alard, Guiscard, and Richard. When the Duke presents his sons to Emperor Charlemagne, Reynaud distinguishes himself in tournament and is given the magical horse Bayard, with the ability to leap across valleys and accommodate any number of riders on its back. Unfortunately, Reynaud kills one of Charlemagne's nephews over a chess game and the four brothers flee on Bayard. The four brothers flee to the Ardennes where their cousin, the sorcerer Maugis, creates a castle for their protection and gives Reynaud a magical sword, Froberge. They do not stay there long, going to Gascony to aid its king against an eastern threat. Reynaud distinguishes himself with Froberge; the king of Gascony rewards him with the king's sister in marriage and a castle. The legend is full of great adventures and feats of derring-do, but the overarching plot requires a reconciliation between the brothers (especially Reynaud) and Charlemagne. Eventually, Roland (another significant figure in Carolingian stories) prevails upon the Emperor to accept the brothers back into his favor. There are conditions. Reynaud must go on a pilgrimage to the Holy Land; this task is made more difficult for him, however, because the other condition is that Bayard must be returned to Charlemagne. Reynaud makes the pilgrimage, but returns to find he is now a widower. He hands his sons over to the emperor to raise and goes to Cologne where he becomes a humble builder in church construction. When he is killed by co-workers who are envious of his ability and thrown into the river, his body magically exits the waters and rides in a cart back to his brothers. Like many other medieval romances, The Four Sons of Aymon was repeated and changed numerous times in various countries and languages. In this case, versions (with various alterations in detail) exist in Dutch, German, Italian, and English. Its popularity endured: during World War II, a play based on the story was produced in Belgium and suppressed by the occupying German forces because of its theme of resisting authority. The play enjoyed a popular underground existence. Today is the birthday of the founder of the Sorbonne. The Collège of Sorbonne is arguably the best-known college in France, its name becoming synonymous with excellence, especially in the field of theology. It was founded in 1257 by Robert de Sorbon. Robert de Sorbon (9 October 1201-15 August 1274) was born in a lower-class family in the Champagne-Ardennes region of northeast France, a wild part of the country prone to spawn legends and tales of adventure. Robert joined the church and studied at Reims and Paris. His devout bearing brought him to the attention of Louis IX, and he was named canon of Cambrai (next door to the Ardennes region) in 1251. He became a teacher in 1253; in 1257 he created a college in Paris which he called Maison de Sorbonne [House of Sorbon] to teach theology to students who could not otherwise afford a university education. The Maison grew in popularity, however, and was endorsed by the King and by Pope Alexander IV (previously mentioned here and here). The College of Sorbonne grew to become the heart of the University of Paris (which produced such lights as Jean Buridan as well as conflicts). Sorbon became its chancellor until his death in 1274. Sorbon created an academic environment that was (in the words of one scholar) "as opposed to mere hostel foundations and elementary forms of collegial living." Among the students were Pope Clement VI and Nicholas Oresme. *[roughly] "To live socially and collegially and morally and scholarly"
Yesterday's post on St. Anthony's Fire mentioned the Annales Xantenses, the Annals of Xanten covering 790-873. 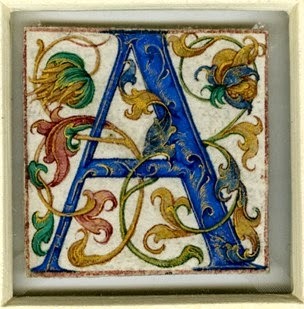 The manuscript was found in the Cotton Library (as Cotton Tiberius C XI), and assumed to be annals of the Abbey of Xanten on the mouth of the Rhine. Another theory is that it was compiled by Gerward, a 9th century royal historian connected to the monasteries of Lorsch and Ghent. In that same year the heathen broke in upon the Christians at many points, but more than twelve thousand of [them] were killed by the Frisians. Another party of invaders devastated Gaul; of these more than six hundred men perished. Yet owing to his indolence, Charles ... agreed to give them many thousands of pounds of gold and silver if they would leave Gaul, and this they did. Nevertheless the cloisters of [...] most of the saints were destroyed, and many of the Christians were [led] away captive. According to their custom the Northmen plundered eastern and western Frisia and burned down the town of Dordrecht, with two other villages, before the eyes of Lothair ..., who was then in the castle of Nimwegen, but could not punish the crime. The Northmen, with their [boats] filled with immense booty, including both men and goods, returned to their own country.At this same time, as no one can mention or hear without great sadness, the mother of all the churches, the basilica of the apostle Peter, was taken and plundered by the Moors, or Saracens, who had already occupied the region of Beneventum. The Saracens, moreover, slaughtered all the Christians whom they found outside the walls of Rome, either within or without this church. They also carried men and women away prisoners. They tore down, among many others, the altar of the blessed Peter, and their crimes from day to day bring sorrow to Christians. Pope Sergius departed life this year. After the death of Sergius no mention of the apostolic see has come in any way to our ears. All very sad. Also, not all accurate. Pope Sergius II died 24 January 847 and was succeeded by Pope Leo IV on 10 April 847. The slowness of communication—perhaps exacerbated by the constant invasions from "Northmen" (Norse)—must have made them think that the papacy was left vacant for a longer time than it was. Diagnosing medieval diseases has its difficulties. Modern research must rely on accurate recording of symptoms and knowledge of potential causes. And yet, we manage to estimate the likeliest causes of the ailments of long-gone centuries. 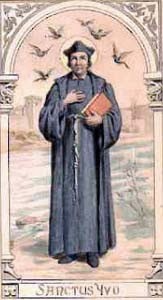 Geoffroy du Breuil of Vigeois was a Benedictine who recorded events from 994-1184 in his Chroniques. He mentions preparations for the First Crusade and the Cathar heresy. He also talks about an outbreak in France of an illness that caused rampant gangrene. This is believed to be a case of St. Anthony's Fire. St. Anthony's Fire was so-called because it was most successfully treated by monks of the Order of St. Anthony. The order was founded in 1095 by Gaston of Valloire and his son, because the son had been cured from the symptoms by the relics of Saint Anthony the Great. The symptoms of St. Anthony's Fire were not only gangrene that caused limbs to fall off but also convulsions, diarrhea, psychosis, headaches, nausea, vomiting, and an uncontrollable itching feeling. Now we equate St. Anthony's Fire with ergotism, caused by the fungus Claviceps purpurea which infects rye, barley, and other grains. 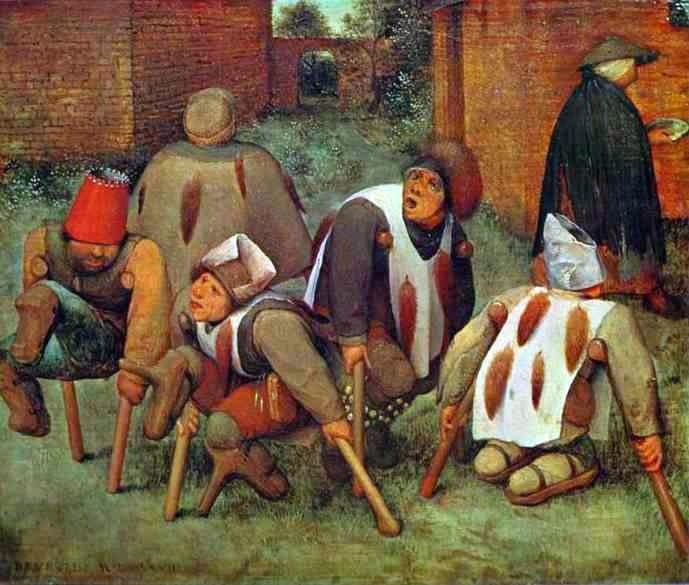 Ergotism also explains a plague in 857, mentioned in the Annales Xantenses. 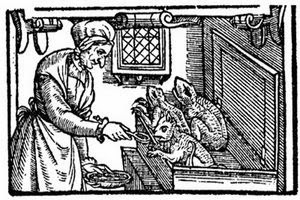 It is also a proposed explanation for anecdotes of bewitchment found in the Middle Ages and later, including in Puritan New England. We have discussed the ultimate torture—to be Hanged, Drawn, and Quartered—here and here. Now let us take a brief look at the man whose crimes against the king were considered so heinous that this punishment was created for him. 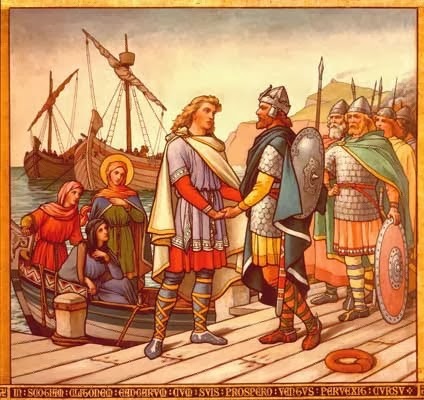 Dafydd ap Gruffydd (1238-3 October 1282) was Prince of Gwynedd and the grandson of Llewelyn the Great, who ruled all of Wales and was on such good terms with King John that he married John's daughter. Unfortunately for Llewelyn's descendants, the kings of England did not get along well with the rulers of Wales. It did not help that the rulers of Wales had difficulties with challenges from their own subjects, either. In 1255, Dafydd and his brother Owain challenged their older brother, Llewelyn (named for their grandfather). In a battle that lasted about an hour, Llewelyn defeated his younger brothers and had them imprisoned. Although Owain stayed in prison until his death in 1282, Dafydd was soon released (perhaps his youth was considered a mitigating circumstance). But Dafydd did not learn his lesson. In 1263 he joined King Henry III (most recently mentioned here) in attacking his brother again. Despite the differences between England and Wales, Henry in 1267 acknowledged Llewelyn as the rightful Prince of Wales. Once again, Dafydd was reconciled with his older brother. Not yet having learned his lesson, however, Dafydd (and other minor Welsh nobles) joined with the newly crowned King Edward I (whose long career would give him plenty of experience with traitors) in 1274 to try to conquer Wales again. This conflict resulted in the Treaty of Aberconwy, which agreed that Llewelyn (hereafter called "Llewelyn the Last") would rule, but with his death Wales would become subject to England. Prior to his death, his rule was limited to lands west of the River Conwy; the Welsh lands east of the Conwy (about 25% of the size of Llewelyn's) were put in the hands of King Edward's new friend and ally, Dafydd ap Gruffydd! Again, in the spirit of treaty-making, Dafydd was restored to friendly relations with his brother. Dafydd's grasp of reality was scant, however, and he apparently did not realize how much of his "success" he owed to the generosity of Edward, rather than to his own political and military skill. Edward started a massive fortress-building campaign along the Welsh border, and started establishing English presence within the borders. By the spring of 1282, the discontented Welsh were assembled by Dafydd and attacked Hawarden Castle during Easter Week, beginning the final military conflict between the two countries. Llewelyn felt obligated to support his fellow Welsh in their misguided endeavor. In December of 1282, Llewelyn was killed. He was tied to a horse's tail and dragged through the streets to the place where he was hanged. His body was cut down before death was certain; he was revived, then he was cut open and his entrails pulled out and set afire so that he could see it all happening. * His body was then cut into 4 pieces, the parts going to different parts of the kingdom to be put on display. The person given the task of seeing all this done, Geoffrey of Shrewsbury, was paid 20 shillings for the job. The execution took place on 3 October 1283. 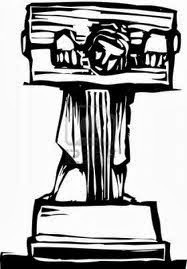 *Supposedly, the extra-vicious nature of the punishment was recompense for having started the revolt during Easter week. Yesterday we talked about the gold bezant and the difficulty in understanding what it was worth. We only know what things were worth in history when someone records what they paid for something. We know, for instance, that Cécile Dorel was "worth" 10,000 bezants. Thanks to the efforts of others, however, we have some idea of the purchasing power of certain currencies. Here is a page that lists several prices, gleaned from medieval records in England. It offers the different years those prices were recorded, so that one can try to account for changing value over time. Also, an English groat was worth 4 pence. Keep in mind that Marco Polo considered a bezant to be worth 20 groats, or 80 pence; this would make a single gold bezant the equivalent of 6.66 shillings, or one-third of a pound. Let's say we found three gold bezants while we ransacked Constantinople in 1204 as part of the Fourth Crusade. (This was alluded to here; some day I will decide to tackle that complex story.) We take them back to England, and we decide to spend them. We have a whole pound to spend. What shall we do? According to the above webpage, if we wanted to buy livestock we could get 10 pigs, or we could buy about 500 chickens. Chickens came two to a penny, but if we just wanted eggs, that penny could get us two dozen. If we wanted to enjoy the country life but didn't want to farm, we could rent a cottage for four years (5 shillings/year). That's going to be a one- or two-room affair. 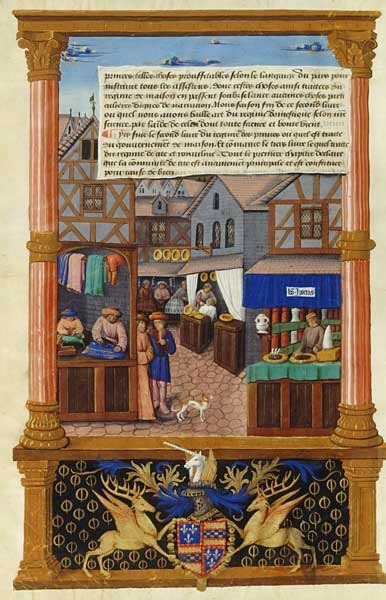 In town, renting a merchant's house (which would have several rooms for personal and commercial use) would require about 10 bezants, not the three we have. If we bequeathed the bezants to our descendants (and assuming they maintained their worth), our great-great-grandsons could have bought three peasant-quality swords for joining the Hundred Years War. If, however, we just wanted to spend the money on a feast for our neighbors, we could provide a real Babette's Feast. At this point, we've spent just over 160 pence of our 240. Alternately, we could probably forgo all of this materialistic pleasure and buy a book. One book. If we were lucky, we'd have three pence remaining and could buy 2 pounds of tallow candles by which to read it. Yesterday's post mentioned 10,000 bezants being paid as a bride price. Let's discuss the bezant. Discussions of items of currency in history break down into two parts: "Where did it come from?" and "What is it worth?" The first part is far easier to deal with. You might guess that the name bezant comes from its relationship to its place of origin: Byzantium. * Gold coins could be called after a particular place because they were not that common: few places minted them, silver and bronze being the more common metals used (hence, of course, the traditional use of gold, silver, and bronze for medals in competition). Gold coins were used for special occasions or for attention-getting: gifts, tributes, awards or, as we saw yesterday, impressing your fiancé's guardian. Gold coinage started in antiquity in the Middle East and eastern Mediterranean and slowly spread westward as trade increased. 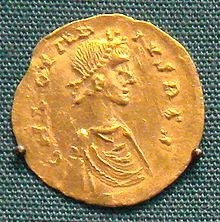 Of European merchants, those from Italy had the most familiarity with eastern gold coins from the east and used the term bezant to refer to gold coins from Egypt (the dinar in the above picture); Marco Polo used bezant to refer to the gold coins he saw in East Asia. What was a bezant worth? That depended on a lot of factors, and there was no "gold market" like we have today that monitors fluctuations in price. The best we have in most cases is a comparison to other coins. Marco Polo describes one bezant as worth 20 groats or 133.33 tornesel. This tells us only that gold coins were proportionally far more valuable than other metals. The gold coins that were minted in England in the 10th and 11th centuries were decreed to be worth nine times the value of a similar-sized silver coin. Suffice it to say that any gold coin had much more purchasing power than most coins in circulation that the average person would be likely to use on a daily basis. Unfortunately, we do not have lists of prices of everyday items or services from history...but we do have some, which we will look at tomorrow. *Byzantium was re-named Constantinople in 330CE; later, of course, it became Istanbul in 1930. Enjoy the song. There is a medieval anecdote in the so-called "Chronicle of Ernoul" that, though fanciful, is based on a true story. The author, "Ernoul," names himself in his Chronicle and says he was a squire of Balian of Ibelin, one of the Crusader nobles who helped take and maintain (for a short time) Jerusalem. He tells a story of a bride (Lucie) who was put on a large scale by a suitor, who offered her guardian (Raymond III of Tripoli) the lady's weight in gold for the privilege of marrying her. The true story is just as demonstrative of the power of gold, however, and doesn't need a set of scales. The lady was Cécile Dorel, who inherited lands in Tripoli upon the death of her father. Raymond III (1140-1187), Count of Tripoli, was her uncle. Raymond was approached by two men for Cécile's hand in marriage (and the coastal lands in Tripoli that she now possessed). One of the men was Gerard de Ridefort. His origin is uncertain, but by the time of this story he was in the service of Baldwin IV of Jerusalem and held the title Marshal of the kingdom, putting him in charge of all mercenaries and disbursement of spoils of war. This would have been a noble match between Gerard and Cécile, but Raymond III acted differently. He married Cécile to the nephew of a Pisan merchant. Why? The bride price was too handsome to ignore. The bride price was money or valuables offered to the family of the bride by the groom or his family in order to ensure the marriage (feel free to read "buy the woman"). The Pisan nephew, whose name was Plivano, offered 10,000 bezants for Cécile. Bezants varied in weight and value, so it is difficult now to determine exactly how much that bride price was worth in today's money. It was clearly, however, an amount not to be ignored—and not easily matched—and so Plivano had his bride. Gerard took the loss poorly and fell ill. He swore off women, apparently, and became a Templar, going on to a great career in that order. That, however, is a another story.